Lowell Johnson was born in San Mateo, California in 1949. He lived Menlo Park and later moved to Ladera next to Stanford University. He graduated from Woodside High School. Lowell attended U.C. Berkeley where he obtained a B.S. Degree in Political Science. He obtained his Juris Doctor degree from Santa Clara University Law School. While attending law school he worked part-time in some of the Peninsula's first class restaurants. He began his legal career at the Law Offices of Moerdyke & Hannon in Palo Alto, a firm specializing in Estate Planning and Probate Law. Mr. Johnson moved to Newark in 1982. 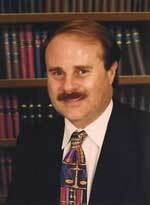 He became an associate with Duman, Branch & Armstrong, a Castro Valley firm specializing in general real estate practice. He later joined the Fremont law firm of Snow & Snow, A P.C as an associate attorney specializing in Family Law, General Business Practice, Probateand collections. In 1992 Mr. Johnson opened his own office specializing in real estate law, Probate & Estate Planning, Personal Injury and assisting small business owners in various legal issues. Lowell married Sue Gallegus in 1985. They have a daughter, Jessica. Lowell's interests include organic vegatable container gardening, black & white photography, gourmet cooking and grass roots politics. He has appeared on several Bay Area talk shows in connection with his cooking skills including People Are Talking. Call us now to set up a free 30 minute consutation. We offer a 30 minute consutation to hear the details of your situation and advise of how we can be of service. Call us at (510) 794-5297. Our goals are to assist our clients in various legal maters which they may face, and to assist them in meeting their business and estate plans and goals. We strive to achieve satisfactory results for reasonable fees. Low cost rates are available for those in special need on a case-by-case basis. Attorney-supervised paralegal document preparation is available at affordable fees. We attempt to accomodate the time demands of those by making office conferences available during evening hours and on weekends.